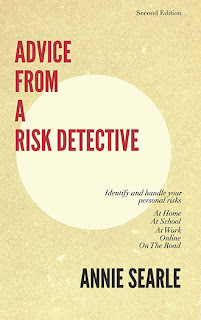 Advice From A Risk Detective: Eye of the Needle. Two of seven reviewers have already sent back their comments! Emily's working her last magic on the manuscript, managing the risk of conversion into an entire different program. Jesse gets the hand-off very soon. Emily pointed out this morning that she never could have known when she became an ASA intern last October that she would actually participate in the creation of a book. I'm interviewing candidates for the ASA academic year internship today and over the weekend. We've added a few new responsibilities this year, including support and maintenance of a new Office 365 site to manage work; and (voila!) support for the book's launch and marketing campaign. It's going to be an interesting autumn!